Febreze has got your back no matter what your needs are. If you have a stinky area that you want to absorb some odors and give off a fresh scent, Febreze has got a product for you. Febreze isn’t just a spray bottle anymore. Febreze has 5 different collections and 7 different product types. Disclosure: As a #PGmom I receive special perks such as products or compensation. All opinions are honest. This post includes affiliate ads. If you buy something through these links, you will not pay more but I will receive a small amount of money to help pay for blog fees. The original Febreze, this is the spray bottle that you use on fabrics that can’t be thrown in the wash. Think couches and lounge chairs, mattresses and carpets. Even curtains and throw rugs. There is even a Fabric Refresher designed for your cars and pets! This is the Febreze you spray in the air. It eliminates odor and gives a burst of fresh smell. Use Heavy Duty for those tough odors, Allergen Reducer for your allergic child’s bedroom and Sleep Serenity for your bedroom to help you sleep. This is a special little clip you clip on to your heat vents so when air moves through your car, it carries the fresh scents with it. No more stinky car! Use in combination with the car Fabric Refresher for boosted scent. Try Smoke Odor Eliminator, Meadows & Rain, Happy Spring or even New Car scent. The NOTICEables are the plugin in oils dispensers that have two scents. It changes scents every so often to make you notice them more. Try Hawaiian Aloha, Gain Island Fresh or Greek Seaside. SmallSPACSE is the little plastic odor eliminator that you can set and forget. Pop it up to release the scent. Try Heavy Duty Crisp Clean, First Bloom or Sleep Serenity Warm Milk and Honey. These are perfect for the small rooms in your home or for small apartments. Febreze Candles have been around for a while although they keep changing their look. Remember to never leave a candle burning unattended. You can find candles in most of the scents already mentioned. Wax melts are designed to go in your warmers to provide a fresh scent that slowly infuses the room. Try Jolly Pine or Hawaiian Aloha. 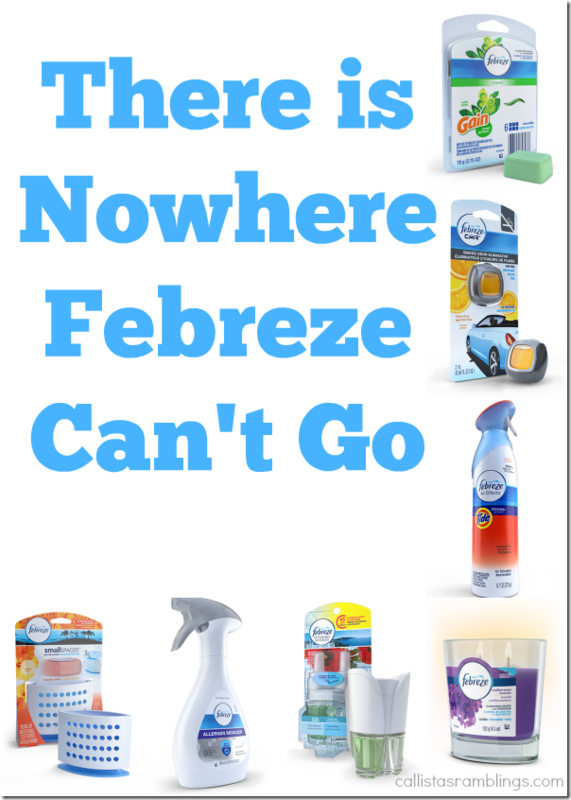 There is nowhere Febreze can’t go. Which Febreze product do you prefer?